Imagine a world where we depend on sunlight and the wind for most of our energy needs. Then imagine nighttime and our main source of electricity literally falls asleep. Unless our future electricity system represents a giant “super-grid” with tons of wires connecting everywhere from San Francisco to Beijing, we will need somewhere to put that electricity when the sun doesn’t shine and the wind doesn’t blow. Along comes battery storage, one of the emerging technology advancements of the 21st century that could revolutionize the way we produce and consume electricity. Traditionally, battery storage has been hailed as too expensive to make sense for grid utilities and customers. However, the economics are quickly changing. With the advent of electric cars going mainstream and countries like France, China and the UK phasing out gas and diesel vehicles, there is a surge in demand for lithium-ion batteries. At the same time, in places like California, where solar PV now powers nearly five million rooftops, grid-scale storage options both in people’s houses and sited by utility operators are lowering the cost of energy. 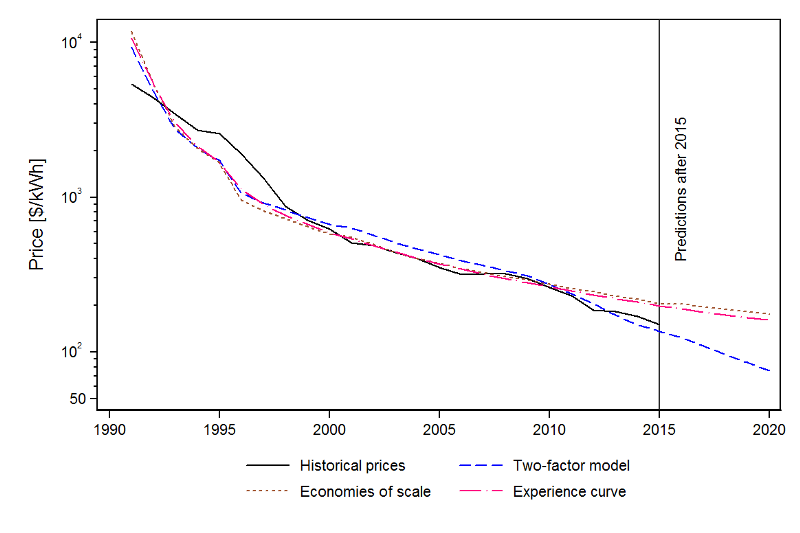 In our recent study published in Nature Energy1, we find that storage prices are falling faster than solar PV or wind technologies at similar points in their cost trajectory. We modeled various cases of where future combined solar, wind and battery storage systems could go and show how these systems would outcompete fossil fuels on the electric power grid. Public and private investment in research and development has been critical to achieve this, yet is currently underfunded in federal budget proposals. This could severely impact our ability to find low-cost solutions to clean our electricity grid that benefits our environment and public health. Nowadays in California, when many households install solar panels on their rooftop, the utility doesn’t have to generate as much power during the middle of the day. They can save energy by turning off some of their conventional generators. However, once most people return home from work in the evening, the sun begins to set and California’s grid operators face a dilemma — how do you counter the rising demand for electricity when everyone is at home and the sun is setting, generating less electricity for grid use? 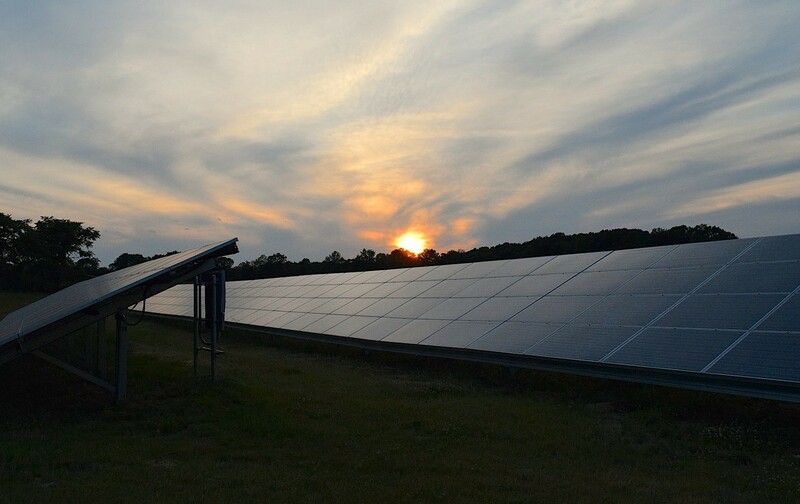 The setting sun completely changes the operations of the grid within only an hour’s time. Natural gas “peaker” plants are often called upon to provide backup and maintain grid reliability to prevent possible outages. However, these combustion turbines are often inefficient and dirtier than their combined-cycle gas turbine counterparts. Battery storage could replace those peaker plants and respond to changes in sunlight and wind availability within seconds. Lithium-ion batteries, in particular, are maturing due to their presence and availability in consumer electronics, electric vehicles, and on the grid. As Tesla moves to install a “Gigafactory” in Nevada and the largest lithium-ion storage battery in the world in South Australia, the innovative combinations of energy storage in terms of size and scale are changing the innovation and investment picture. The Tesla Powerwall is advertised at around $350/kWh. This is still out of reach for many customers. However, the US Department of Energy set a goal for $100/kWh battery storage by 2020. This is achievable, but investments on the research and development side are critical to enable this transition. We found that progress in lithium-ion batteries has developed from $10,000/kWh in the early 1990s to a fraction of that today. The pace of innovation is staggering. Ordinarily, public research investment and private venture capital money undergo tough scrutiny before money can be spent on research. The results from prior years’ hard work are not immediately visible. Our study demonstrates that long-term R&D spending played a critical factor to achieve these cost reductions from our statistical analysis. Modest investments in research and development could go a long way to unlock the low-cost and low-carbon transformative electricity available from solar Photovoltaics (PV), wind and battery storage. One example of the power of battery storage lies in the underestimated potential of solar PV. Installations of solar panels have dramatically outpaced expert predictions over the past decade. But in order to fully utilize that electricity in a significant way, we need to invest in research that can reduce the cost of energy storage that allows us to use solar or wind electricity whenever we want. The story of Tesla and lithium-ion batteries are not the only examples. Berlin plans to install a 120 MW flow battery underground to support wind and solar efforts. California has enacted the first “energy storage mandate” policy on the grid, requiring utilities to procure 1.325 GW of storage by 2020. A diversity of options for storage exists — including, but not limited to lithium-ion batteries. We may see distributed small-scale flywheels on distribution systems to inject short bursts of power in the future combined with vanadium-redox flow batteries providing multi-hour storage with potential to power office buildings during peak demand periods. There is an important evolution happening in battery storage at this moment. The combination of innovation in battery storage for electric vehicle use, transitioning transportation fuels to electricity, and grid-scale storage that enables low-cost solar and wind to become ubiquitous across the world, regardless of geography. This happens due to the portability of different scaled storage devices and the new opportunity battery storage provides. We can control battery storage through computer programs and make solar and wind electricity dispatchable. That is, you can turn solar and wind on and off, just like a light switch. Imagine that, if we can use solar and wind electricity without having to think about whether it’s nighttime or whether the wind is blowing outside, then we can completely phase out fossil fuels from our economy. This presents a low-carbon electricity option that is simply better than coal or natural gas. With batteries that are programmable, they can respond within seconds. No one said this will be easy. It will take concerted R&D efforts similar to the US SunShot program for solar PV. They reached the $1/W goal for solar three years early. Why not storage? As our research suggests, the option is there and financially viable, we just have to embrace innovation and investment in deployment and transformational low-carbon technology.